....it's off on a trip we go! My hubby has never flown, so he's quite apprehensive about the whole experience and it's been over thirty years since I've been in a plane, so I'm sure it's going to be rather nerve-wracking for both of us, but the fact that we will be seeing our kids when the plane lands AND we'll also get to see the Canadian Rocky mountains for the first time will certainly help with the pre-flight jitters. Right now we're suffering from the lists/piles syndrome and scurrying about trying to remember everything we need to take (and do!) before we leave. All this packing and such is definitely foreign to our nature! AND - on a whole other subject altogether I've been (in my spare moments) putzing about with doing a bunch of zentangling. Irene (CQTeers group member) was first bitten by the bug and she has subsequently passed it onto Sue and from there to me. I took a little longer than the other two to succumb fully to the fun. At our last meeting Sue had a brilliant idea and had a book she was devoting to different zentangle patterns so I am using her idea and have started one of my own. Who knew this could be so much fun?? The only problem is that I've 'tangled' so much that my arthritis is flaring up...oops. And now, my friends, I leave you to play amongst yourselves. See you when I get back! Try embiggening it to see the details! Nothing has been happening on the stitching front here at Chez Magpie - too busy being social to have time to pick up the needle. I have just visited a really great site online where you can see the wonderful pieces of fabric art created for the 'Threadworks 2013' show and were on display at the Wellington County Museum in Fergus. The theme is 'water'. The many pieces of art are incredibly varied and I would have loved to have seen these in person, but have to content myself with the online version. Go HERE to see the show. This show was found via Magpie's Collectibles...thanks Maggie! Today's post will be a bit of a hodge-podge because I'm somewhat behind on several things I had wanted to show you. 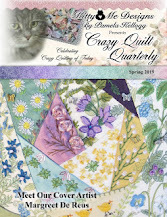 Firstly, I was quite excited to receive my print copy of the latest 'Crazy Quilt Gatherings' magazine in my mailbox on Friday. The article I wrote on creating my hussif, along with the directions to make it, are in this one. I'm published!! Yee - haw!! For those of you who are interested in finding out more (and perhaps ordering a copy for yourself) just click on the cover picture in my sidebar and it will take you there. 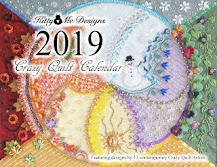 Another long-awaited treasure arrived in my mailbox last week too - my copy of 'Elegant Cross Stitch Sentiments For Crazy Quilting' by Pam Kellogg (Kitty and Me Designs). There are over 50 cross stitch patterns she has designed in the book. All are suitable for many different applications, but you already KNOW I'll be using some of them in my crazy quilting! Go HERE for further info. Once you're there just click on the 'Books' on the top bar and it will take you there. Be sure to return and visit Pam's blog too! The card on the upper left was made by moi last month during a class that Irene gave. The middle card (top row) was made by Sue, as was the one in the lower row middle. Irene created the zentangle on black on the upper right, as well as playing with fabric crayons on the one bottom left. The three in the middle were my work. career in painting in my future (even after I'm dead and buried!! ).